The University of Adelaide hosted Monash in Round One of the Varsity Challenge Cup on Friday, 14 September. Intervarsity sport has a long history at Adelaide and this was the inaugural round in the re-established Netball 'Knock-Out’ Competition. The Adelaide Uni Football team just missed out on the finals going down to Melbourne and our netball team was hoping to at least match the boys' success by making it to the semi. But first the team needed to beat Monash University at Priceline Stadium. From a squad of 14, 10 were picked for the match and despite some sickness within the team, under the leadership of Captain Emma Borlace, all athletes gave their all in a tough, tight game, right to the final whistle. Although close all game and TIED at the half way mark of the 4th quarter, AU was not able to get its noses in front and went down to Monash 47-41. The girls made the most of the limited training opportunities available to them pre-game and utilised with skill, some effective structures and common sense elements of the game which paid off many times over. Defence was strong, Jessamie, Emma, Abbey and Amy all determined to disrupt the Monash attack, resulting in a high number of turnovers. This was no easy feat, with an opposition Goal Shooter dominating and clearly the target for her team mates, shooting all their first quarter goals. At our end, Charlotte and Courtney played out the entire game together in the shooting circle, with both girls working together and converting, supported by some excellent feeds from Nikki, Emily B, Emily J and Kate. It was not all good news, with several turnover opportunities not capitalised on and momentary skill errors, however, the girls moved on quickly at those times, regaining focus and fighting back to produce the nail-biting game that resulted. A very supportive crowd was in attendance and contributed to both the atmosphere and positivity with every cheer. Although this AU team did not get the win, it has set the stage and the benchmark for future students and IV for the years ahead. The team leaves the competition knowing that it has done its University proud. The University of Melbourne Men’s Australian Rules Football team have defeated the University of Sydney to claim the inaugural Varsity Challenge Cup at University Oval. With the sun shining brightly, the national anthem blaring out through the Ernie Cropley Pavilion speakers and Provost Professor Mark Considine tossing the coin, the game got off to the perfect start with Melbourne kicking the first goal in less than 15 seconds. The partisan crowd of some 500 students, staff and alumni, fueled by a free sausage sizzle and pumped up by the marching band’s rendition of Eye of the Tiger, were treated to a blistering first quarter. Despite the fast start and kicking with the wind, Melbourne struggled to convert their remaining chances in the quarter kicking 6 behinds and not adding another goal while Sydney notched two majors to take a 1-point lead into quarter time. The second quarter was again tightly contested with Melbourne kicking two goals to take a narrow 6-point margin into half-time. Whatever the coach said at half-time, it worked. Melbourne were dominant in the third quarter, kicking 5 goals and 3 behinds to Sydney's 1 goal 2, to finish the 'premiership quarter' 31 points ahead. Sydney failed to muster a last-term comeback, and Melbourne ran out 36-point winners to claim the first Varsity Challenge Cup. The final scores were Melbourne 9.17 - 71 to Sydney 5.5 - 35. Melbourne's Sam Allen earned best-on-ground with an impressive 4-goal haul, while Sam Hodge and captain Matthew Blair were also impressive. Former Sydney Swan Lloyd Perris was the standout player for Sydney. The match was streamed live through MU Sport’s Facebook page with a viewership of over 6000. Keep an eye on the Varsity Challenge website for fixtures and results, including the upcoming Netball competition. Melbourne University's Men's Football team are through to the Varsity Challenge Cup Grand Final after a thrilling win on the road at Adelaide University. It was the first win for Melbourne over Adelaide in recent times, with Adelaide having tasted victory on the previous two occasions. The match started with the ground bathed in sunlight with a breeze clearly favouring the cathedral end, which Melbourne kicked to first. First quarter goals to Sam Allen, Matt Blair and Captain Connor Lappin, with Nick Cottrell the sole goal kicker for Adelaide, saw Melbourne go in to the first change with the lead. Adelaide had the run of play in the second quarter with goals to Ryder Thomas and Harry Walters on the blast of the siren sent the game in all-square at half time, after a quarter in which Melbourne failed to register a goal. With competition rules having 16 players on the field it meant the game really opened up in the second half, with Melbourne again able to capitalise on the favourable breeze. Good forward pressure by Melbourne was rewarded with Oscar Dowd able to kick the first of the second half before Eddie Dadds answered straight back for Adelaide with an opportunist snap. Melbourne’s forward persistence paid dividends with Dowd and Allen both able to kick their second goals for the match. Cottrell for Adelaide kept his team in it with a second major, before Nick Ziemkiewicz danced his way around several defenders to kick the goal of the match on the three quarter time siren. The final quarter was pulsating with both teams having opportunities to swing the game in their favour. Adelaide came charging with goals through Aiden Curyer and Ellias Tsouvallas before Harry Walters had a tough chance after the siren to win the game with a shot on goal from the boundary 40 meters out. The shot faded to the right and Melbourne was able to head back to Victoria with the win by just 4 points. Amazingly, Melbourne was unable to kick a goal to the Torrens River end all game, with only 3 of the 15 goals for the match registered in that direction. As the winner, Melbourne will take on the victor of the Northern conference semi-final between University of Queensland who travel to the University of Sydney. The Grand Final will be played early in Semester 2. It’s that time of year again! For footballers, the months of March and April traditionally represent the end of torturous, arduous pre-seasons and the beginning of long-awaited matches. For those student-footballers at the University of Adelaide, these months have also come to represent the beginning of the intervarsity football schedule. Set in a context far apart from the standard local and country leagues abundant throughout South Australia, intervarsity is a platform for footballers studying at the University of Adelaide to come together, put aside their home-club allegiances and represent their university on the national stage. Trials to make the AU intervarsity team began in early March. Numbers and the general excitement around IV has grown year-on-year, and 2018 was no exception. Over 30 footballers registered their interest in playing IV footy this year by showing up to one or both of the trials. 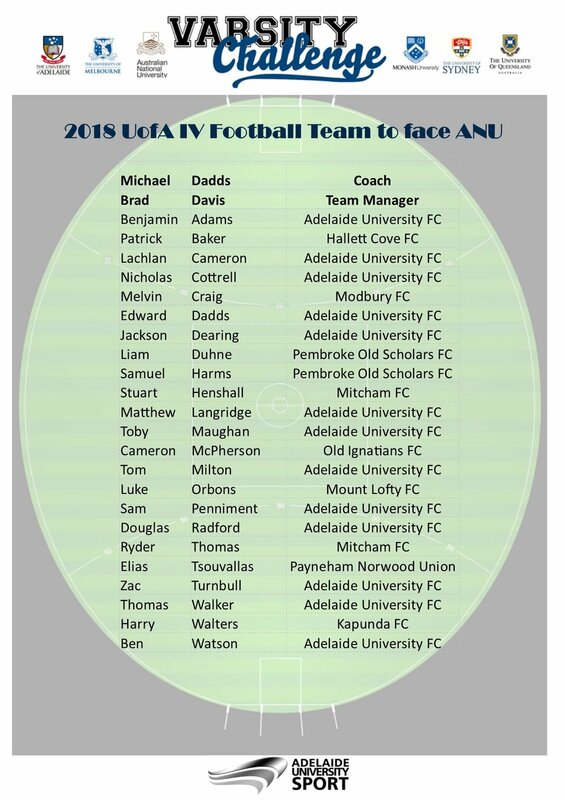 Whilst for some (including key forward Patrick Baker, midfielder Sam Harms and half-back Toby Maughan) it is their third consecutive year of intervarsity Football, 10 members of the team travelling to Canberra will be making their intervarsity debut. Elias Tsouvallas, from the Payneham Football Club Falcons, says he is highly impressed by the standard of the team. Tsouvallas says he feels extremely lucky to be a part of the IV program and is “itching” to get on the plane to Canberra. The Adelaide University team as named below travels to Canberra on Tuesday, 17 April to play Australian National University, before taking on Melbourne University in Adelaide on May 15. Melbourne University were victorious in their round 1 match held at Monash’s Frearson Oval on Tuesday night. The win sets up a Semi-Final clash with Adelaide University in May. Ryan Sack and Sam Allen from the University of Melbourne were unstoppable up forward with player each kicking 4 goals. A tight first half from both teams saw just one goal a-piece scored in the first 30 minutes of play – Ziemkiewicz from Melbourne and Trigg from Monash with the only majors troubling the scorers. Monash kicked the first goal of the second half through Cosgriff, before both teams traded goals within 3 minutes of each other. However, it was Melbourne who was able to wrangle the momentum kicking 6 goals to 2 in the third quarter, heading into the last quarter with a 22-point lead. The highlight form Melbourne being an end to end goal, finishing with Allen getting the ball 50 meters out and winning a footrace against his opponent. Melbourne continued to pile on the pressure in the last quarter, kicking a further 5 goals - before Monash was able to finish the match with a couple of late goals. The score line not quite reflecting the tight nature of the match, with both teams showing determination at the ball and speed and skill throughout. Melbourne’s next match, the Southern Conference Semi-Final, will be against Adelaide University, with the winner going on to play either the University of Sydney or University of Queensland for the Varsity Challenge Cup.